With Day of the Dead coming closer, beginning November the first this year, the one most important thing on everyone’s mind is the sugar skull. 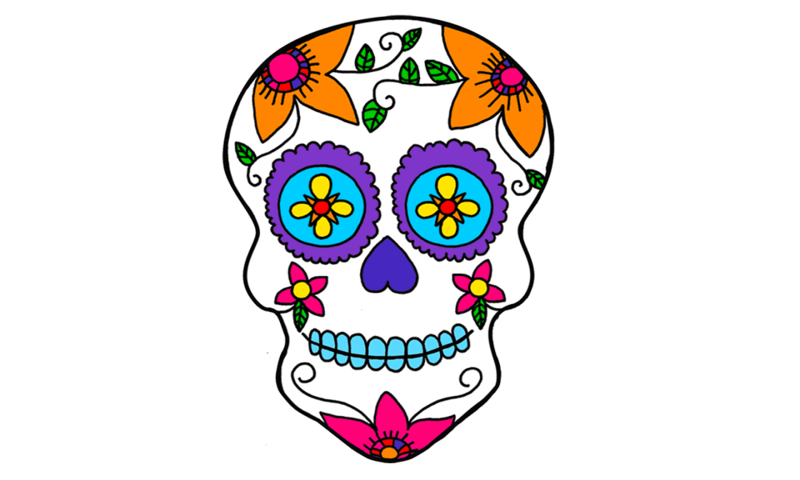 Without the sugar skull, there’s no Day of the Dead, just like there’s no phone without a battery! 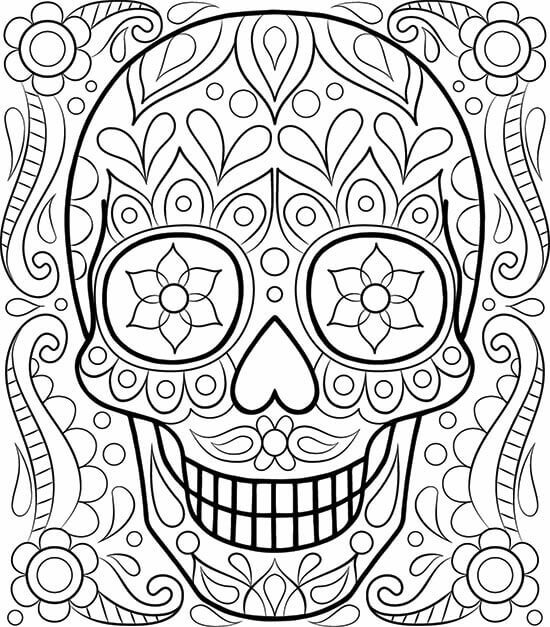 Therefore, we at ScribbleFun, thought that while we have uploaded coloring pages for Day of the Dead, why not upload another set of sugar skull coloring pages as well? We know that’s genius of us – thanks! Sugar Skulls are those skulls made by compressing sugar, worn on Day of the Dead to pay off respects for those who are dead. They are – in most of the conditions – decorated using attractive designs and colors. 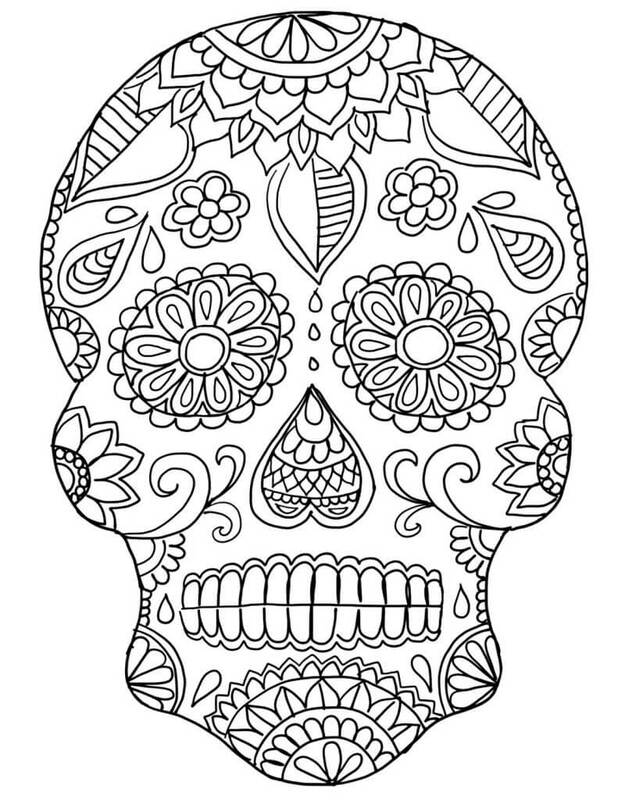 So, you’re going to have some fun time filling these detailed sugar skulls coloring sheets to print! Get your crayons out and start right away! 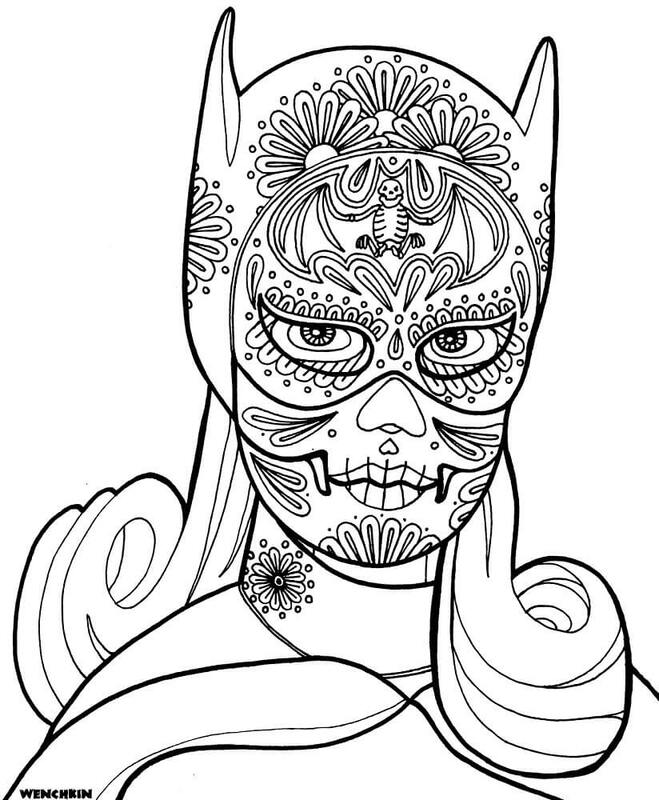 Here’s the bat girl, wearing a sugar skull. Or is that someone else wearing the sugar skull designed like a Batgirl? Well, I cannot tell because it’s decorated just so well. But it will look even better when you will color it. So, what are you waiting for? This sugar skull looks like a head of the bunny. The person who’ll wear this would be very fond of it. But not yet, because there’s something missing. What do you think that is? You’re right! It’s just the colors. Paint this bunny sugar skull just the way it will look great on someone’s face! Make sure it looks realistic. This is such a cool design, no? It’s got all the webs and leaves over it – just looks deadly (perfect for Day of the Dead). Wearing this mask will be the most attention-seeking thing you could do! Add some hues to this mask and make it look deadlier than it already is! Here’s a huge sugar skull, it won’t be very easy to wear it! But if you do manage to wear it right, you will look amazing. But you would look extraordinary only when the leaves are colored bright green, the flowers are colored pink, the mask borders are colored gold and black, and the actual skull is all silver-gold. You get what I’m saying? Then, off you go! Dia De Los Muertos means Day of the Dead. 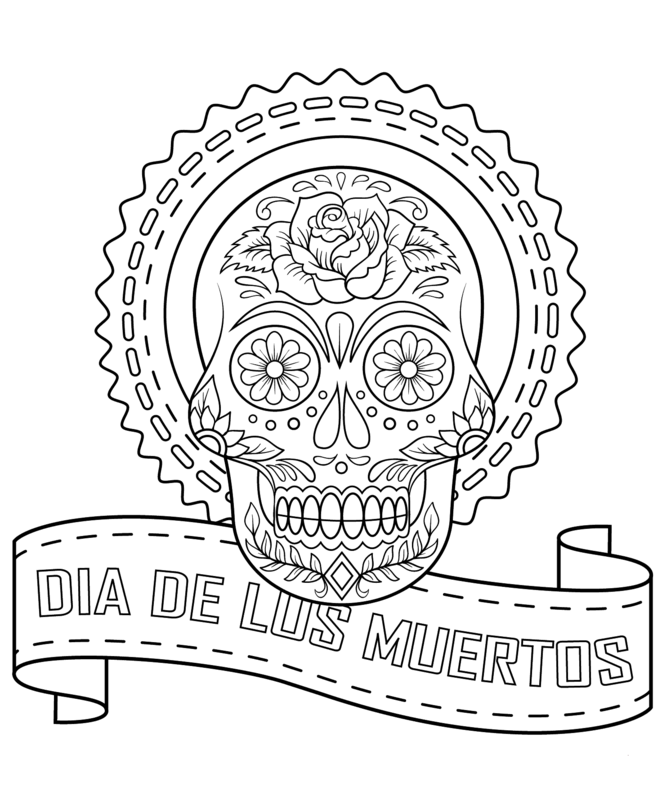 Here’s a cool and heavenly looking sugar skull, with a label of Dia De Los Muertos. Now, all of you who are going to celebrate this day – including me – will surely want to use this as a brilliant poster and put it on the room door! There are just millions of dog lovers out there – and you can be one of them! 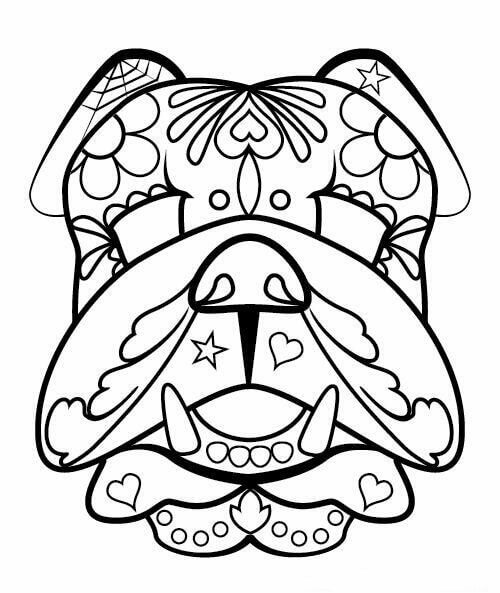 Here is a dog sugar skull for all of you dog lovers, who would just like to induce the dog factor into pretty much everything! It’s cool to actually have it in a sugar skull! I don’t need to tell you anything this time because you know more than me about dogs! 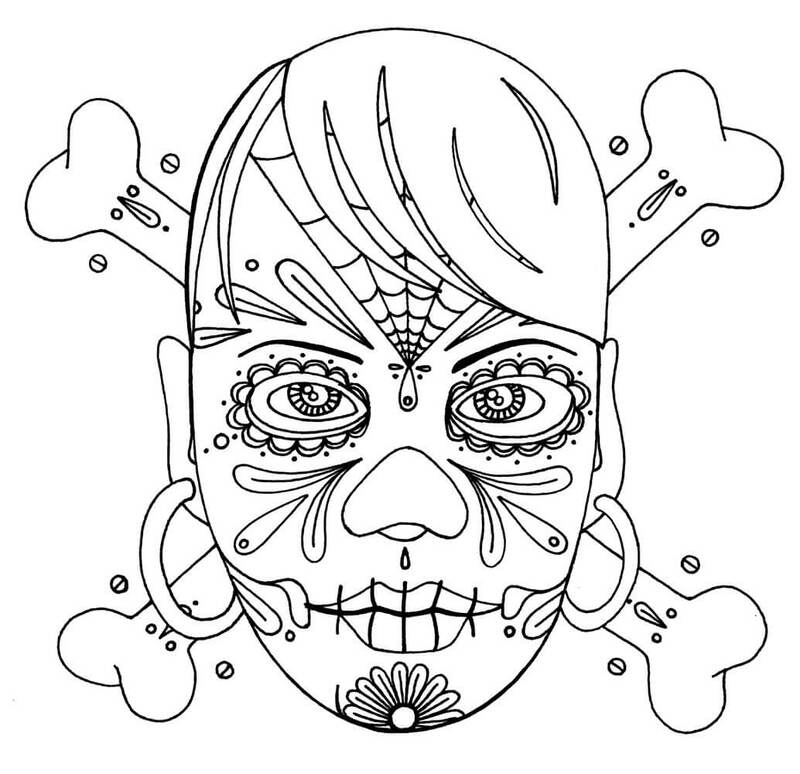 To get you started, this is an easy sugar skull portrait. Now, I know that you excellent artists do not require such a start, but don’t you think it’s better to do first with the easy, and gradually move on the difficult to maintain the excitement and charm of the sugar skulls? Get on with this one! 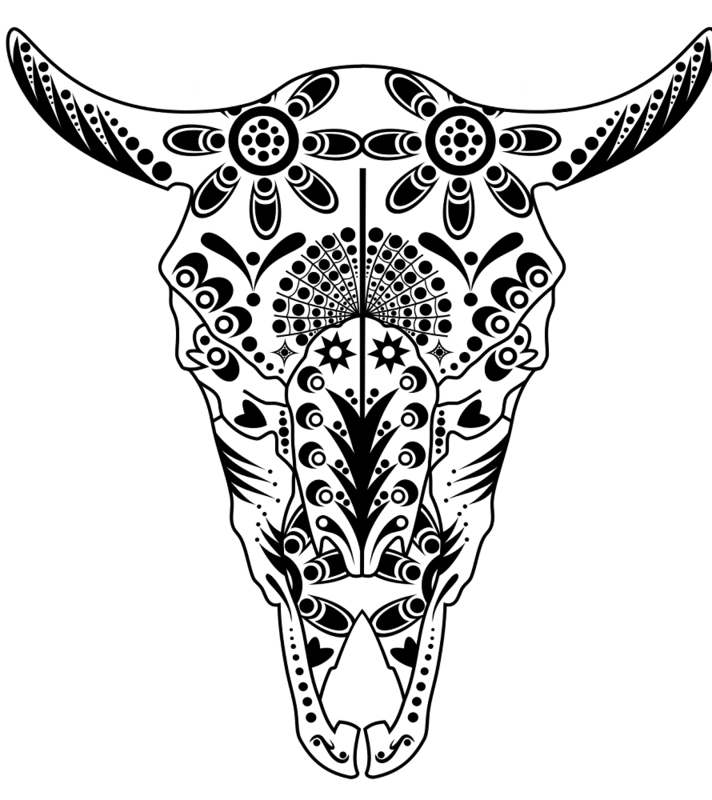 Here is another sugar skull with brilliant design, the eyes looking like flowers and the wavy design over the face looks so cool. 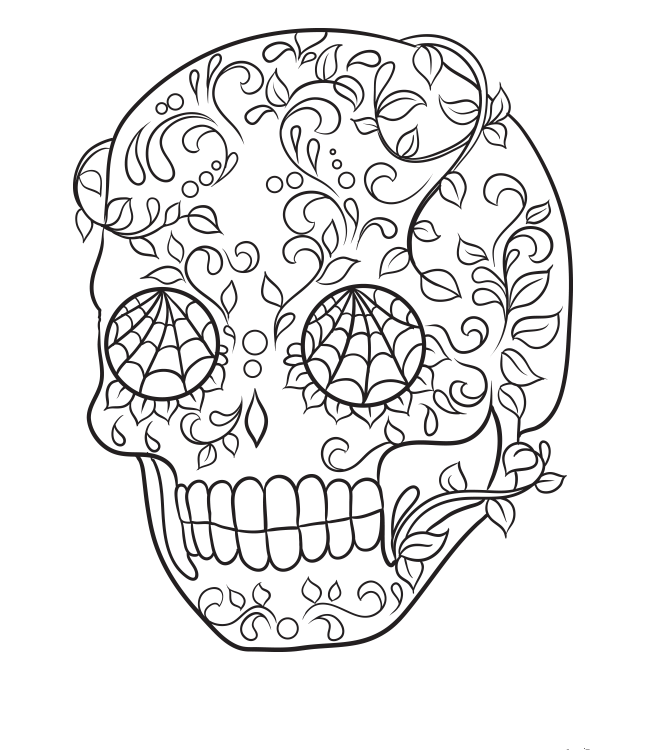 But this is not finished yet – for you still have to color this to complete the glamorous sugar skull! 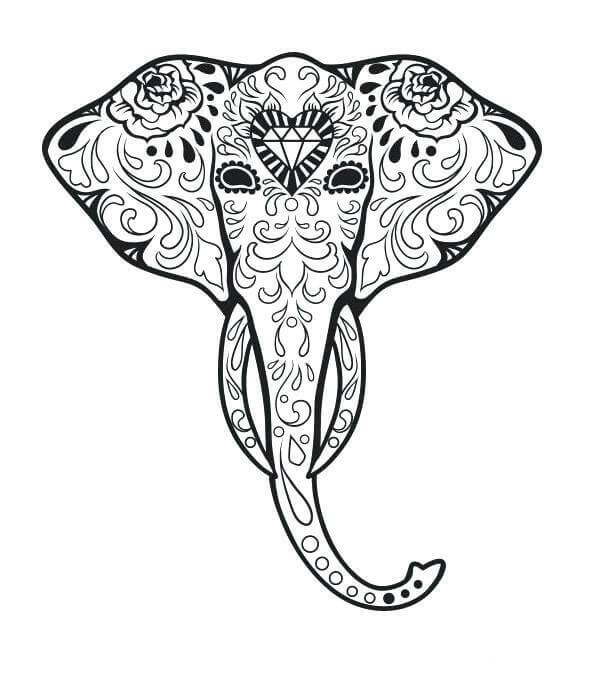 I just love elephants – they are huge and powerful and have amazing teeth. After seeing this image, I could not resist printing it immediately, coloring it to excellence, and tying a ribbon around it to use it as a mask. In case you a just like me, you can do the same! If you’ve got some more crafty ideas, so get it done and also share what you’ve done with me in the comments section below! 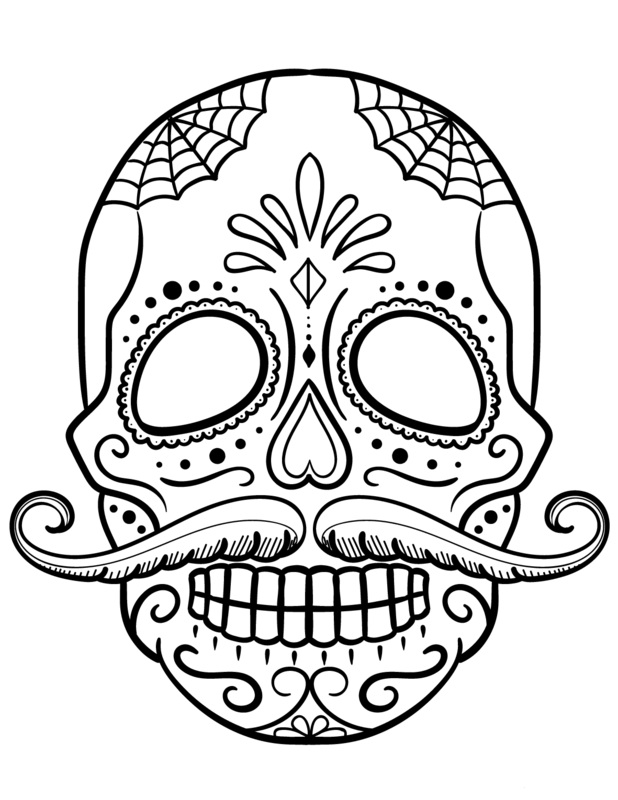 Here’s a sugar skull that’s grown a mustache of itself. Looks like a cowboy, and I think that’s probably the one to whom this skull belonged. So, make sure it looks like a cowboy even when you color it. Although this is rare, some Mexicans also celebrate the death of animals, generally those who were kept as pets. Here is the image of a dead duck. Notice how in the image the duck has been decorated with drawings such as the rose and the stripes on the body? That is the traditional method of decorating the dead. 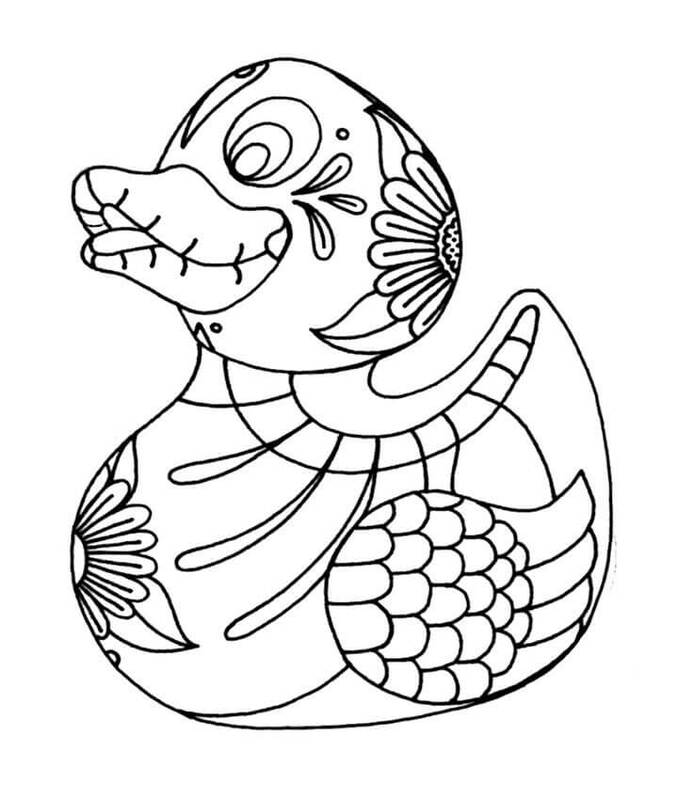 Add some shades to the duck! Hmm… those who are seeking pride (or those who are proud already) are just like the lions, the pride of the jungle! What else, then, should the people like you wear for the day of the dead other than a sugar skull of your fashion and of your pride! Here you go with one, shade it your way and wear it your way! 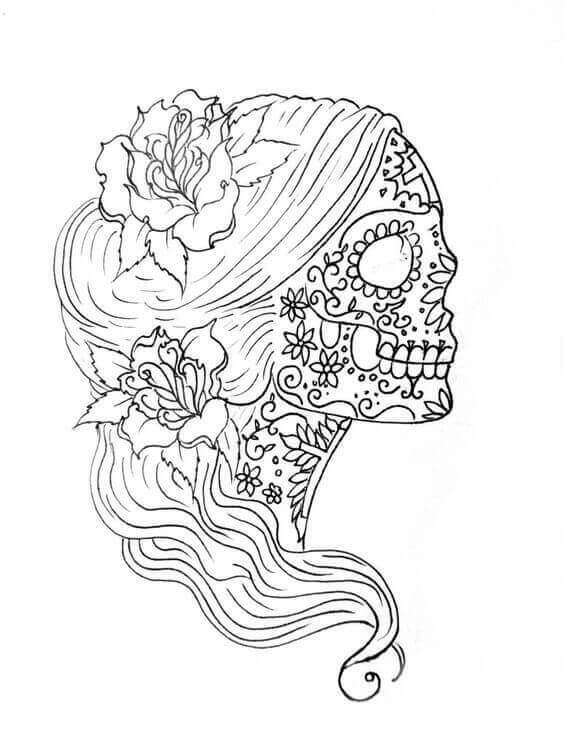 Here’s a brilliant sugar skull of a girl, with excellent design and precision. Give this sugar skull suiting hues and make it look just the most beautiful sugar skull you can wear! If you think you’ve got the nerves to be called an expert at ScribbleFun, here’s your chance to compete and prove it to us! Following is an intricate sugar skull, with details as complex as my Mathematical studies! Get it done flamboyantly and put in the comments section below for us to check. That’s when we can know who’s the expert! Kermit the frog is a character in Muppet – one of my favorite TV Shows! Kermit has become so famous that people actually want to wear his mask! Here’s a great chance for you to make yourself an amazing Kermit mask! Very well, then! Get on! 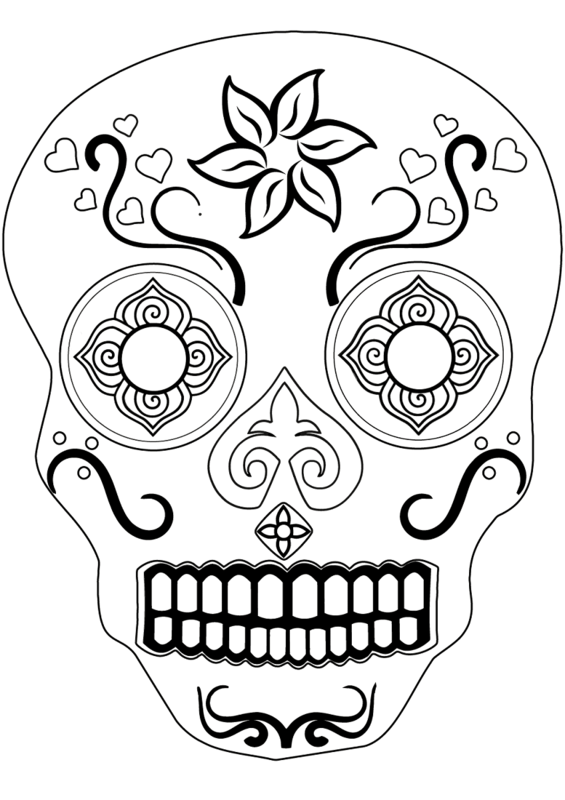 For people who like stuff simple – like me – here’s a clear, simple, and tidy Sugar Skull. Who says that simple is not awesome? 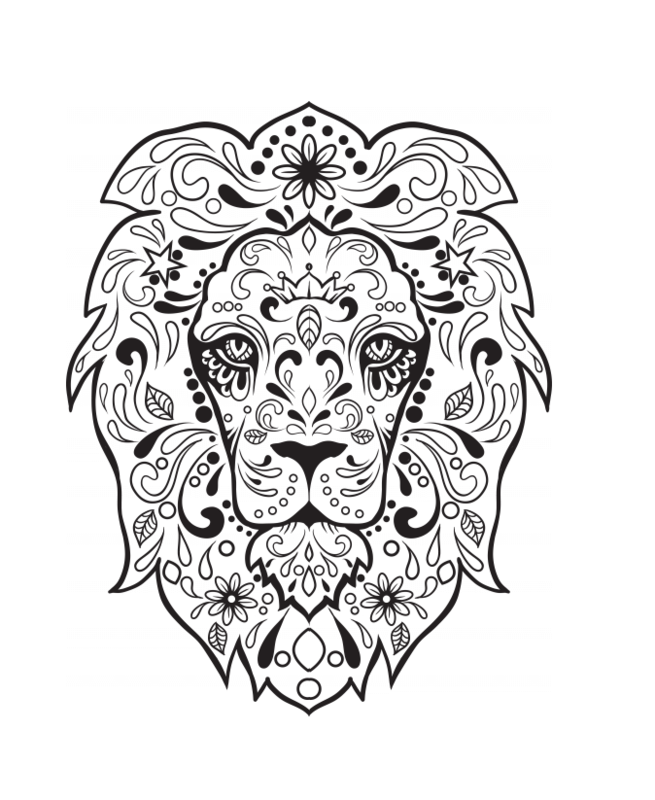 Color this awesome-awesome and show the world the power of simplicity! Take a look at Sponge Bob. 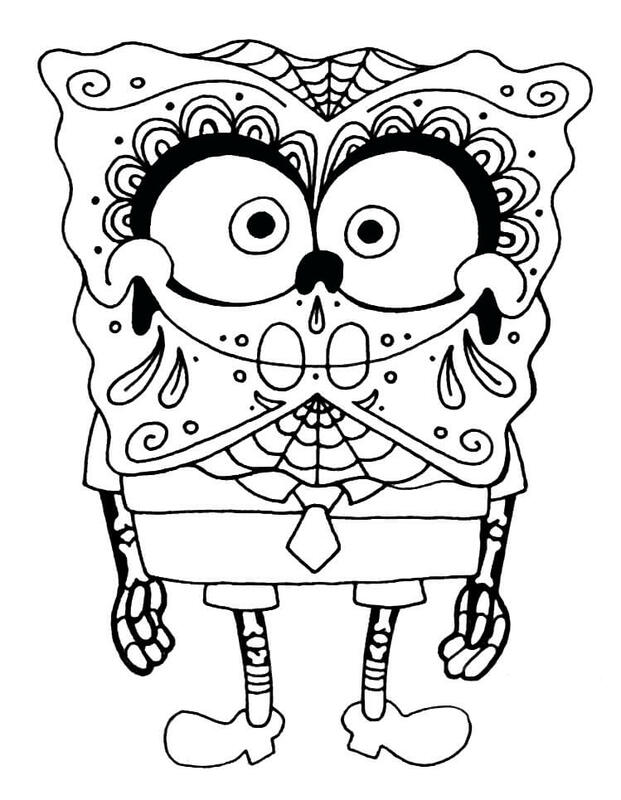 I am sure you have watched the cartoon, but have you ever imagined Sponge Bob in the Day of the Dead? Well, he has been decorated well. But the decorations yet miss the one thing – colors! Uses your expert skills to color Sponge Bob in the Dead. Can you guess who is this character from Star Wars? Well, the character just has something about him that makes him look like a person of command and authority! Anyone wearing this Sugar Skull surely has similar specifications. Are you one of them? And those who can’t, it’s Darth Vader. 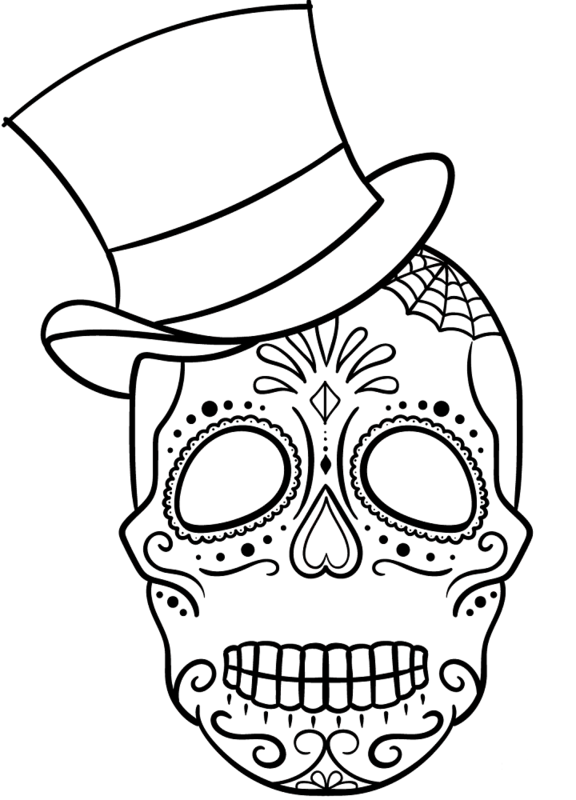 Get this one shaded and put it up on your face on Day of the Dead this year! Own is one of the least understandable creatures to me. They just sit with their huge eyes wide upon throughout the night! I mean, they are so scary already that they don’t need a Day of the Dead! Anyways, keeping my fear aside, here’s a Sugar Skull made like an Own (anyone wearing this wants to look scary for sure). So, color this on its way to horror! Here’s a detailed, intricate sugar skull which looks very attractive. The one thing I really like about this is that leaf-thingy on the forehead, half of which is covered with lines and the other half which is blank. 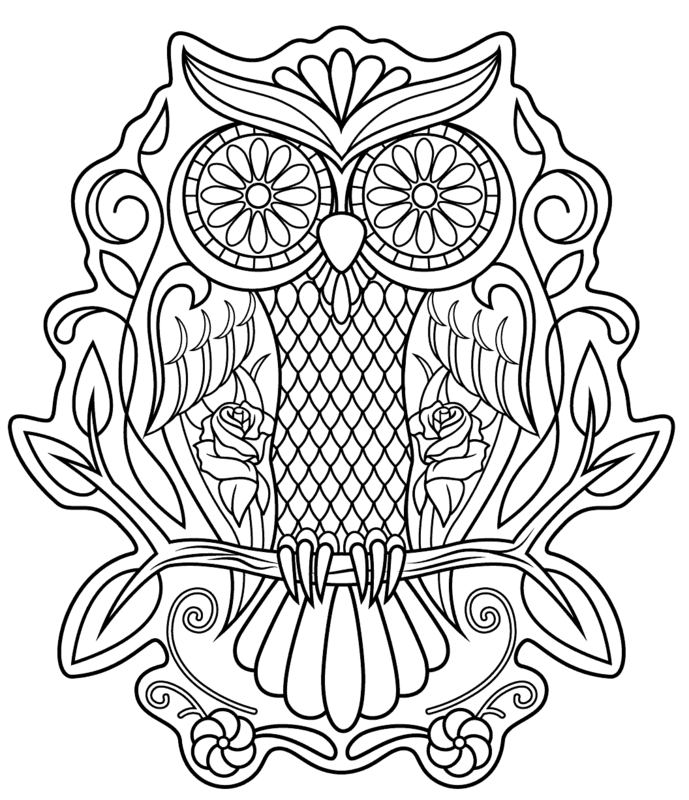 It looks to eye-catchy, I cannot get my eyes away from it until I color it! I’m sure you’re going through similar circumstances, so just get your colors onto it! 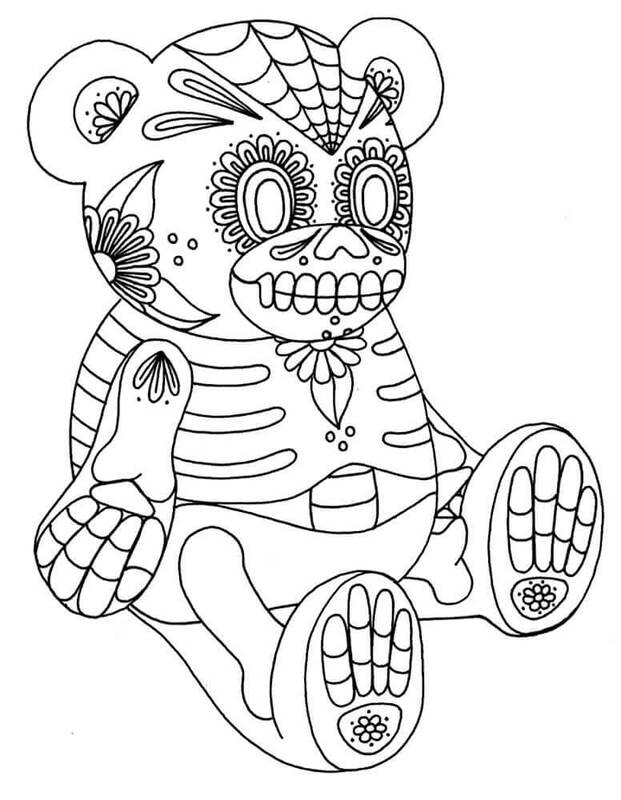 Here is a cute Teddy, who also celebrates the Day of the Dead with all the Mexicans each year. He has chosen to decorate himself as a skeleton and has chosen to tattoo flowers and leaves over his face and body. Can you also notice the leaf-tie below his neck? But this Teddy has yet not colored himself, because he’s looking for someone who can give in great colors. And who’s that but you? Here’s a fine and neat Sugar Skull. 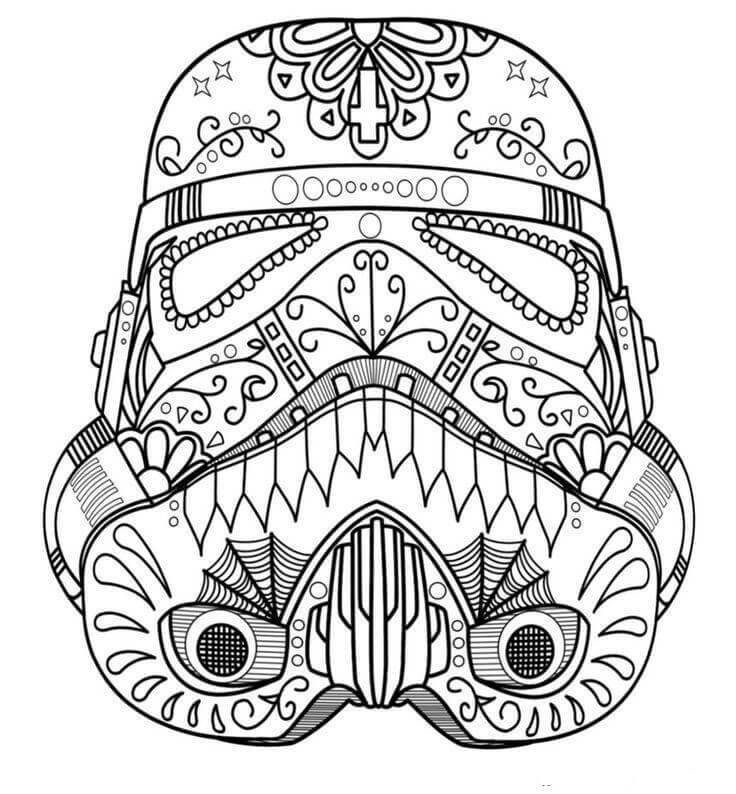 Not only can you color this one, but you can also add your own design to it because there’s so much space. 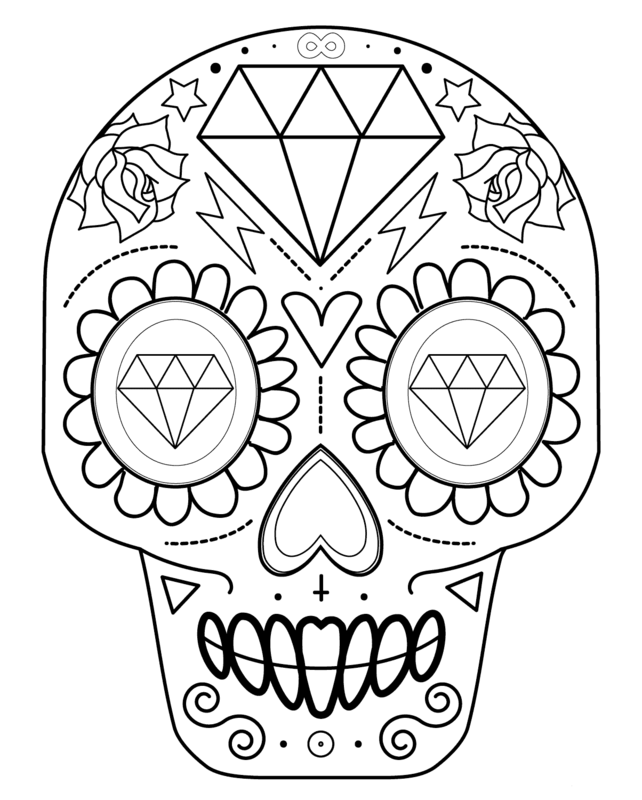 So, if you’re looking for a sugar skull which you can design, here you go! Most of the Mexicans love to wear hats, and here’s a Sugar Skull targeted just for that. You have a chance to give a hat a unique color so that you can be spotted even amongst the largest of crowds on the Day of the Dead. Get on it quickly! This is a poster which you can put around your room to keep yourself reminded of the Dead and pay off your respects to them. 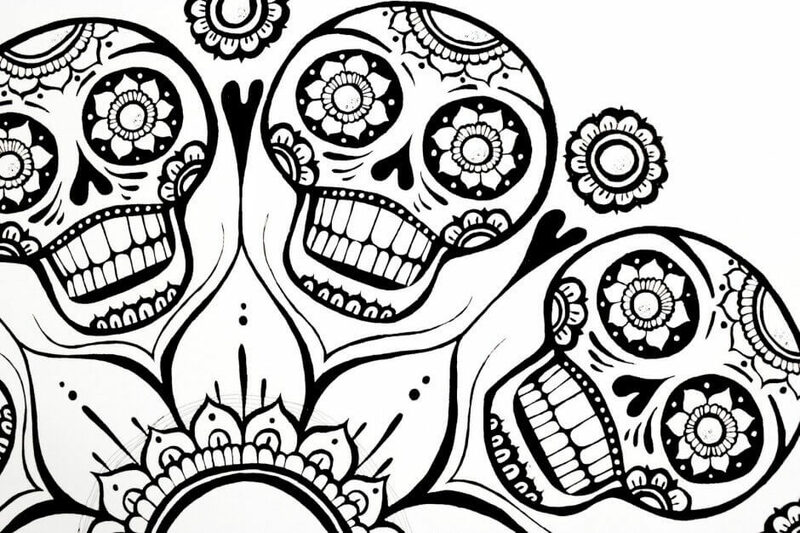 It features a flower-like design where the Sugar Skulls are the petals. Quite a unique design. And if you are looking for something definitely “off-the-menu” to do, then here you go! 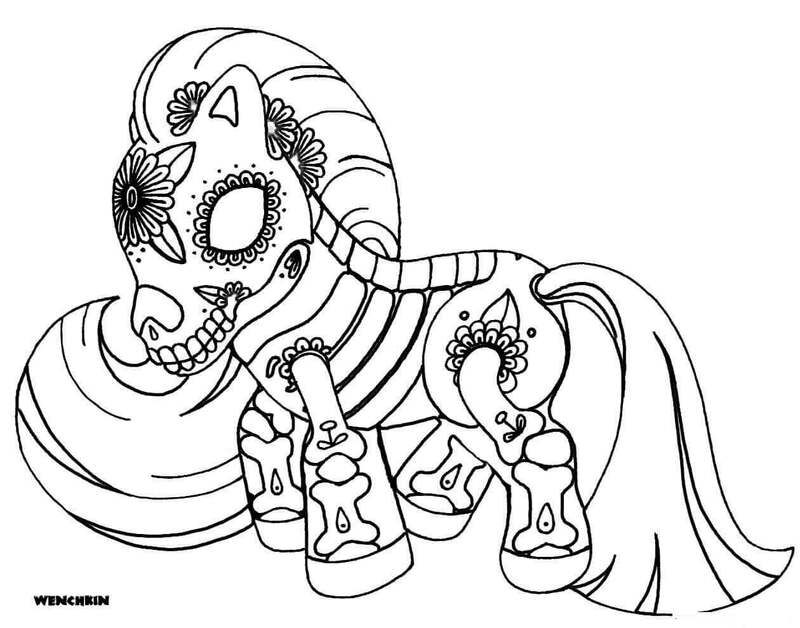 Glance over this adorable pony enjoying Dia De Los Muertos, praying for the dead members in her family. Doesn’t she look remarkable with the decorations over her body? Color her cute. 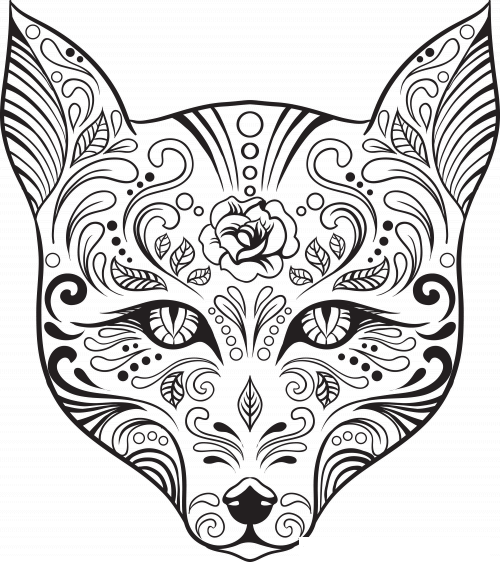 This is the sugar skull appearing to be of one of the sleekest animals. Notice how the face is long and narrow? It can easily cut through anything in its way. Why not use this one a something different? Cats are alert and quick animals, and here’s a sugar skull representing the cats. If you think that you’ve got those talents which the cats do, then take this as your sugar skull! After all, the sugar skull should represent the person wearing it! 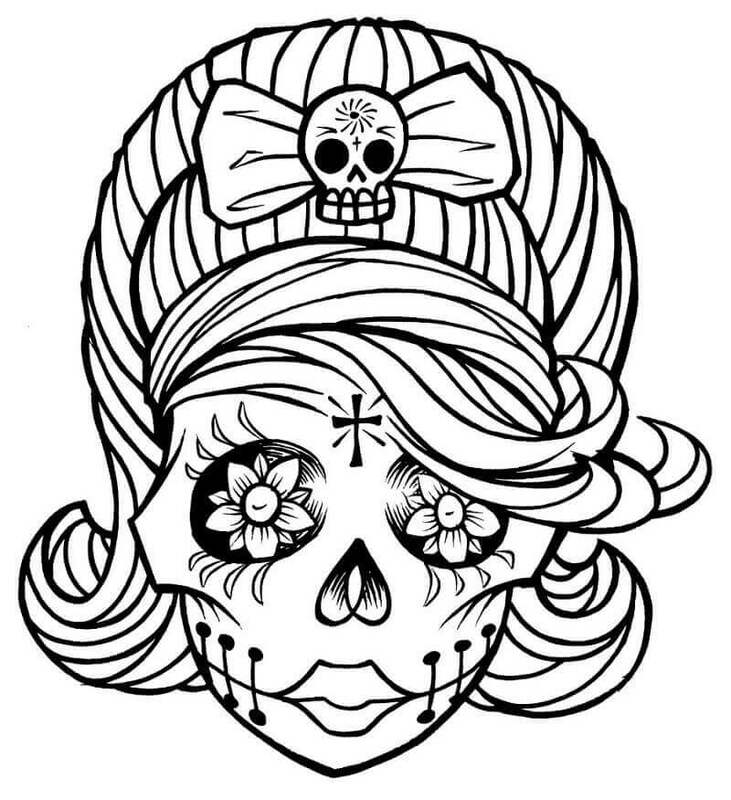 Here’s one more design for a girl sugar skull. I like this one in particular because of the bushy hair and plump cheeks. What do you think? I’m sure whatever your perspective is, it won’t go against the design of this sugar skull. This is the sugar skull of a woman, apparently from the left-side view. This sugar skull has some great design, with the flowers, leaves, and petals all over the face. It looks amazing. Why not give it some shades using your genius art design and make it look splendid! 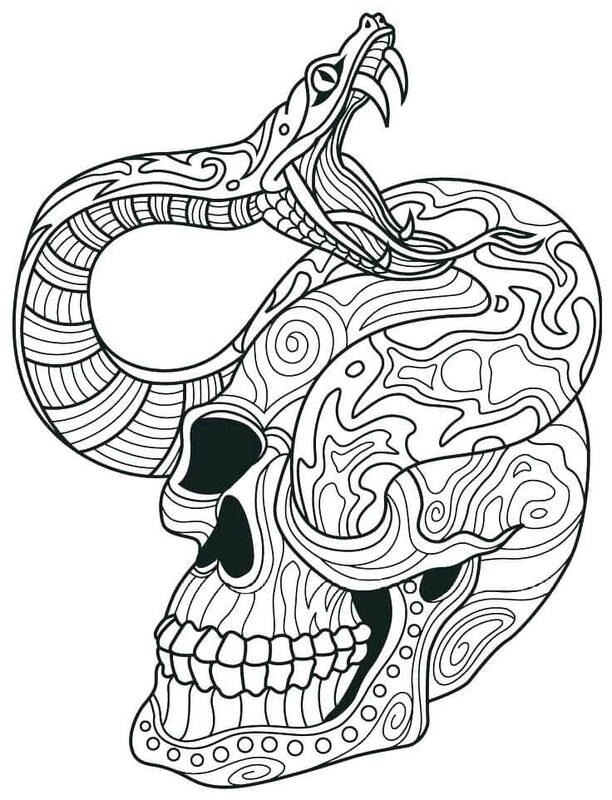 Many people not only wear the sugar skulls, but also have its tattoos over their body parts like arms. Generally – their color is red and black, but you can do whatever you like because your genius art design will not be questioned! Okay, amigos! 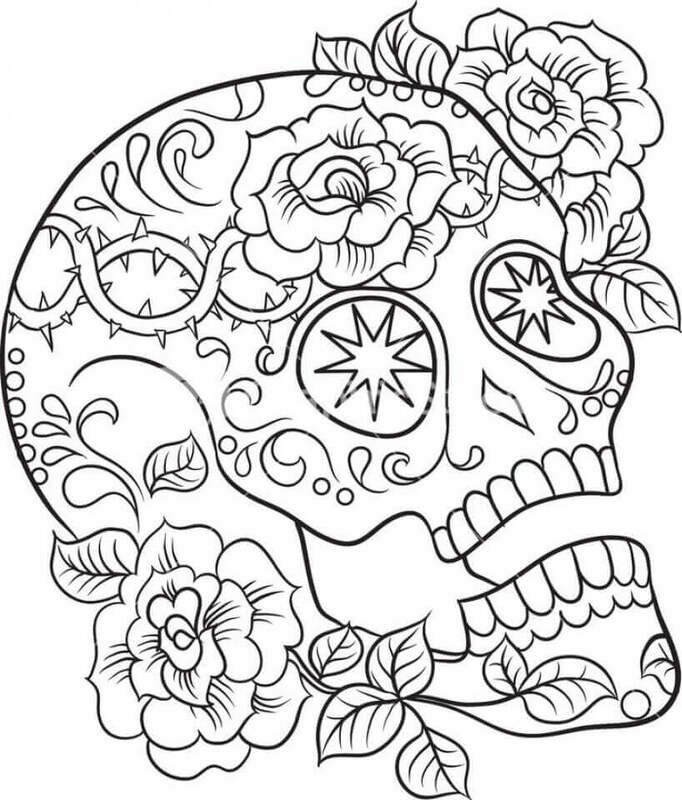 I’m sure these various designs of sugar skulls (some even cartoonish and extremely unique) would have interested you deeply and inspired you to celebrate the Day of the Dead this year with their glamorous and attractive design. You know, I’m extremely confused! 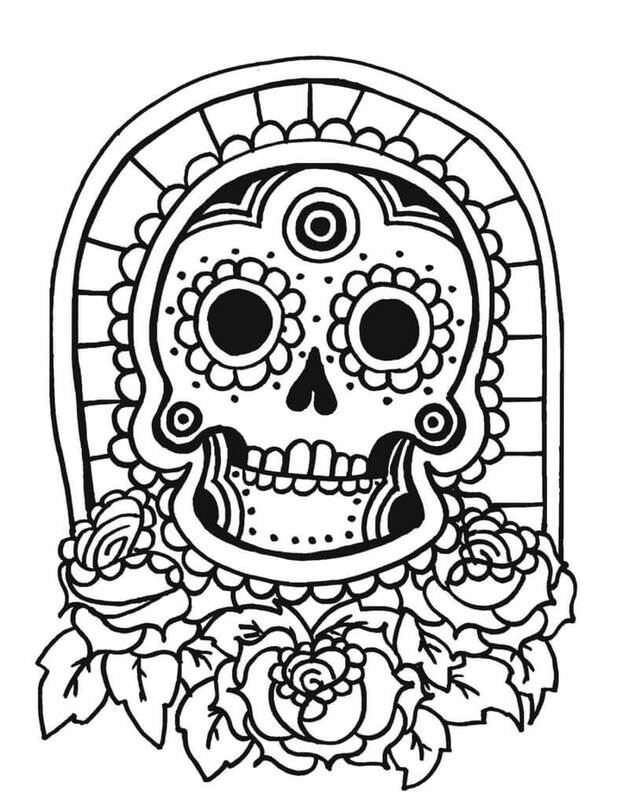 Which one of these – all brilliant – sugar skull coloring pictures to print out and wear this year in Day of the Dead? I mean, it is hard to choose when everything that is so good and appeals your senses exceedingly! Is there a similar situation with you? 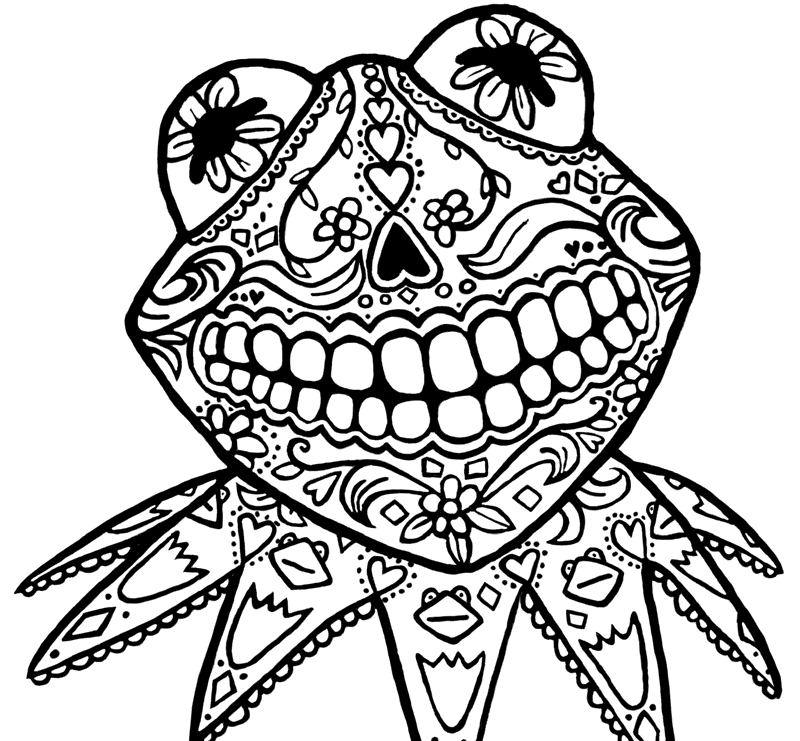 Share your perspective, your favorite design, favorite sugar skull coloring images and anything else you’d like us to know in the comments section below!